Canadians will go to the polls in May to elect their fourth national government in seven years. BBC News looks at the candidates, parties and issues in play. In late March, a parliamentary committee found the Harper government to be in contempt of parliament because of its failure to disclose the full costs of anti-crime programmes, corporate tax cuts and plans to purchase stealth fighter jets from the US. This was the first time in Canadian history that a government had been found to be in contempt of parliament. Liberal leader Michael Ignatieff then offered a no confidence motion, which passed by 156 votes to 145. That forced parliament to adjourn and compelled Prime Minister Stephen Harper to ask the Governor General, David Johnston, to dissolve the parliament. Mr Johnston issued the writs of election on 26 March, and the election will be held on 2 May. Why has Canada held four elections in seven years? Since the 2004 Canadian election, no party has won a majority of seats in the House of Commons. The two major parties, the Conservatives and the Liberals, have been forced to form minority governments, negotiating with opposition parties for their support on legislation. But minority governments are by their nature unstable, and both parties have had difficulties finding workable compromises. Mr Harper's entire tenure as prime minister - he won election in 2006 - has been at the helm of a minority government. His is the longest-serving minority government in Canadian history. One result of the large number of recent elections is concern among commentators about voter apathy. Turnout is expected to be low on 2 May. Who is Prime Minister Harper's main rival? Mr Harper is the leader of the Conservative Party, one of Canada's two main political parties. His opponent this year is Michael Ignatieff, head of the Liberal Party. Mr Ignatieff is a relative newcomer to Canadian politics having been first elected in 2006. He rose quickly, becoming Liberal leader in 2008. Prior to politics, Mr Ignatieff, a well known author, taught human rights at Harvard University in the US. He has also worked as a columnist and as a journalist on several BBC programmes. Mr Harper began the election with a significant lead over Mr Ignatieff in the polls. Mr Ignatieff has challenged Mr Harper to a one-on-one debate, in addition to the traditional multi-party debates. The two major political parties are the Conservatives, a centre-right party, and the Liberals, a centre-left party. There are also several smaller parties that in recent years have won enough seats to work with the dominant parties on an informal basis. The Bloc Quebecois, led by Gilles Duceppe, is currently the third largest party in the Canadian parliament. It is devoted to promoting the interests of the province of Quebec, and believes that Quebec should ultimately secede from Canada. The Bloc Quebecois is primarily supported by Quebec residents and campaigns actively there. The New Democratic Party (NDP), led by Jack Layton, is a social democratic party which has progressive policies on issues such as gay rights and health care. The Green Party, led by Elizabeth May, is a centre-left party which promotes environmental sustainability and non-violence. Ms May and the Greens have not been invited to participate in the candidate debates, prompting a lawsuit which experts say is unlikely to succeed. The Liberals are also attempting to cast the debate as being over the honesty and integrity of government, highlighting the contempt of parliament ruling. The NDP is focused on health care, particularly access to doctors. 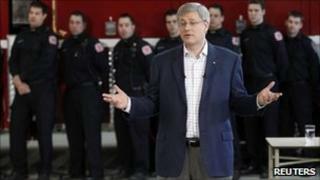 It has criticised Mr Harper's perceived lack of action on the issue. In terms of foreign relations, Canada's ongoing commitment to the war in Afghanistan and its recent military engagement in Libya may become issues. What are the main battlegrounds? The key to a majority in any Canadian election is to win big in the populous provinces of Ontario and Quebec, which between them account for 181 of the 308 seats in the House of Commons. Will Canadian opposition parties push Harper out?